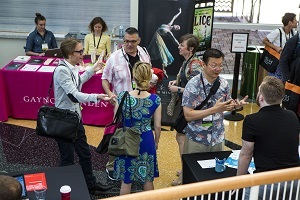 Gain unparalleled access and exposure to nearly 500 of the professional dance field’s managers, artists, representatives, and service providers by sponsoring the 2019 Annual Conference which will take place in Cleveland, OH from June 12-15! Tremendous opportunities are available – from tote bag branding to networking break support, Opening Plenary sponsorship and more – and all at a variety of price points. Recognition starts with your commitment and includes visibility on Dance/USA’s website, Conference mobile app, signage, print material related to the 2018 Conference, and more. Contact April Gruber, director of development, today to discuss your interests and design a customized benefits package that addresses your unique marketing and impact objectives.